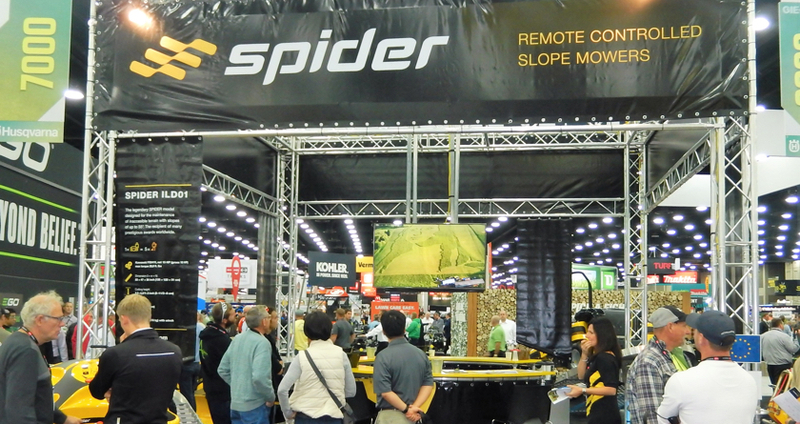 Spider Slope Care had a very successful show at the GIE+EXPO in Louisville, KY, in October. It’s not often these days that machines are sold at a show, but this happened on booth 7188 when a prospective customer saw the Spider ILD02. He then went outside to see the machine working on the demonstration booth and immediately placed the order. Finance was arranged in a single day and the Spider ILD02 was driven onto their truck at the close of the show. “This is unprecedented. We have never done this in the USA before; it really made the show for us. We exhibited last year with a major presence and it really has paid off. Many more visitors knew of us and that previous exposure has definitely raised awareness of the brand and capability of our products. “Along with the Spider ILD02 we also exhibited the smaller version, the ILD01; our dedicated mower for mowing under the panels on solar farms, the Spider 2SGS and an alpha prototype of our Spider 3RIDER. This unique mower has three steering options, a 90” (2.3 metre) width of cut and can be can be operated by remote control on slopes up to 30 degrees, by an operator who will be in a safe position away from the machine. “The outdoor demonstration area was also a huge draw for visitors; it generated significant footfall back to the indoor booth and really worked well for us. We’re already looking to improve our interaction with visitors next year and are planning a bigger outdoor area to provide an opportunity to drive the machines.